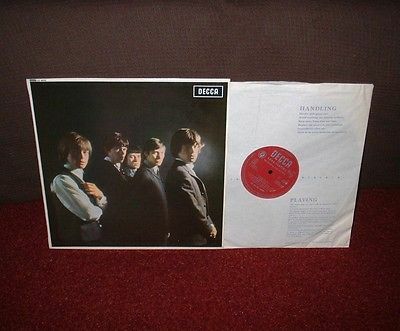 ROLLING STONES 1st LP 1964 Decca MONO! MINT!! RAREST EVER TRIAL COVER!!!! FIRSTLY IT IS IMPORTANT TO MAKE CLEAR JUST HOW RARE THIS LP REALLY IS (AND I AM NOT OVERSTATING THIS ONE BIT!)!!!! FOR EXAMPLE, AROUND 5000 COPIES OF THE '2.52' PRESSING (FEATURING THE WITHDRAWN 'DEMO' VERSION OF 'TELL ME') OF THIS LP WERE MADE (USING 3 DIFFERENT MATRIXES) - AND THAT VERSION IS RIGHTLY CONSIDERED AS EXTREMELY RARE INDEED!!!! AND YET ONLY 500 COPIES AT THE VERY MOST - WERE EVER MADE WITH THIS ULTRA RARE 'TRIAL' COVER - MAKING IT 10 TIMES AS RARE AS ANY '2.52' PRESSING!!!! AND IN FACT, I AM PROBABLY BEING EXTREMELY GENEROUS SAYING AS MANY AS 500 COPIES!!!! THIS LP CAME FROM AN EX DECCA ENGINEER & MANAGER WHO WAS PERSONALLY INVOLVED IN THE PRODUCTION AND TRIAL OF THIS COVER PERSONALLY!!!! HE STATES THAT ONLY '1 BATCH' WAS EVER MADE OF THIS COVER TYPE - FOR TRIAL PURPOSES ONLY!!!! NOW NATURALLY HE COULD NOT BE SURE OF THE NUMBER - BUT DID DID SAY THE ABSOLUTE MAXIMUM AMOUNT MADE IN ANY BATCH OF COVERS WERE 500, THOUGH IN THIS CASE HE PERSONALLY THOUGHT IT WAS FAR FAR LESS THAN THAT - AS THIS COVER WAS MADE FOR A TRIAL, AND NOT FULL PRODUCTION RUN!!!! SO ALTHOUGH I AM SAYING THAT 500 COPIES WERE EVER MADE - THIS IS THE MAXIMUM AMOUNT THAT COULD HAVE POSSIBLY BEEN PRODUCED, AND IN REALITY - IT IS MORE LIKELY THAT ONLY 50-100 COPIES WERE EVER MADE FOR 'TRIAL' PURPOSES ONLY!!!! 1) ON THIS ULTRA RARE 'TRIAL' COVER - THE CLARITY OF THE PICTURE OF THE BAND IS FAR FAR BETTER, AND FAR FAR CLEARER THAN ALL NORMAL 'RELEASED' COVERS!!!! THERE IS NO 'BLURRING' AT ALL - AND YOU CAN SEE FAR FAR MORE DETAIL THAN ON THE NORMAL RELEASED 'DARKER' COVERS!!!! 2) ON NORMAL 'RELEASED' COVERS THE BACKGROUND IS EITHER JET BLACK, OR AN EXTREMELY DARK BLUE/GREY COLOUR. HOWEVER ON THIS ULTRA RARE 'TRIAL' COVER - YOU CAN CLEARLY SEE THAT THE BACKGROUND IS A MUCH LIGHTER SHADE OF 'GREENY/BROWN' INSTEAD!!!! SO NOT ONLY IS THE COVER MUCH LIGHTER - BUT IT IS ALSO A COMPLETELY DIFFERENT COLOUR ASWELL!!!! 3) THIS ULTRA RARE 'TRIAL' COVER IS HALF AS THICK AS NORMAL 'RELEASED' COVERS AND WEIGHS VERY LITTLE INDEED!!!! 4) THE 'DECCA' LOGO IN THE TOP RIGHT CORNER IS NEARLY ALWAYS THE SAME AS THE BACKGROUND COLOUR ON NORMAL 'RELEASED' COVERS - BUT ON THIS ULTRA RARE 'TRIAL' COVER - YOU CAN CLEARLY SEE THAT THE 'DECCA LOGO' IS A COMPLETELY DIFFERENT COLOUR COMPARED TO THE BACKGROUND!!!! EVENTUALLY HOWEVER, ALL THIS EFFORT OF A RE-DESIGN WAS UNSUCCESSFUL - AND IT WAS ULTIMATELY REJECTED!!!! ACCORDING TO THE DECCA EMPLOYEE - IT WAS REJECTED AS BEING TOO LIGHT IN SHADE, THE WRONG BACKGROUND COLOUR, AND THE COVER WAS TOO THIN FOR PRODUCTION. HOWEVER, THIS 'TRIAL' COVER, ALTHOUGH REJECTED - DID SERVE A PURPOSE EVENTUALLY!!!! BECAUSE AS MOST ROLLING STONES FANS WILL ALREADY KNOW - CHANGES WERE MADE ON LATER COVERS OF THIS LP FROM 1965 & 1966 ONWARDS (THOUGH NOTHING LIKE AS DRASTIC AS THIS 'TRIAL' COVER!). HOWEVER, THESE EVENTUAL CHANGES WERE ONLY MARGINAL DIFFERENCES - SUCH AS FRACTIONAL LIGHTENING IN THE COLOUR, AND SLIGHTLY LESS THICKNESS TO THE COVERS AS THE 60s WORE ON. HOWEVER NOTHING LIKE THIS 'TRIAL' COVER WAS EVER MADE AGAIN, EITHER BEFORE OR SINCE - WHICH IS WHY IT IS ONE OF THE MOST DESIRABLE ROLLING STONES VARIATIONS EVER MADE!!!! AND ALSO PLEASE NOTE - THIS COVER IS A 100% GENIUNE UK 1964 COVER IN EVERY RESPECT - BEING MADE BY 'MacNEILL PRESS', THE COMPLETE UK TEXT ALONG THE BOTTOM, SUPERB FLIPBACKS ON THE REVERSE (WHICH WERE DROPPED IN 1965! ), AND HAVING THE USUAL DISTINCTIVE 'DECCA SPINE' - BEING 'PLEATED' ON EITHER END (LATER ONES DONT!)!!!! ONLY 500 COPIES AT THE VERY MOST (MORE LIKELY 50-100) WERE EVER MADE OF THIS 'TRIAL COVER' - AND IT WAS NEVER EVER USED AGAIN!!!! IT IS UNDOUBTEDLY THE RAREST EVER VERSION OF THIS LP EVER MADE - AND THE CHANCES OF EVER SEEING ANOTHER ONE (ESPECIALLY IN THIS TOP CONDITION!) AGAIN ARE VIRTUALLY ZERO!!!! NOT ONLY THAT BUT THIS LP IS IN ABSOLUTELY SUPERB CONDITION - AND HAS BARELY BEEN PLAYED AT ALL (ONLY 2 OR 3 TIMES AT THE VERY MOST!)!!!! JUST TAKE A LOOK AT THE PICTURES!!!! THIS IS THE ORIGINAL 1964 MONO 'TRIAL' PRESSING ON THE UNBOXED'GROOVED' DECCA LABEL, 'HANDLING/PLAYING' INNER SLEEVE AND ULTRA RARE 'MacNEILL' FLIPBACK LAMINATED MONO 'TRIAL' COVER (WITH DIFFERENT SHADE, THICKNESS, CLARITY, & COLOUR!)!!!! THIS LP IS SERIOUSLY RARE AND VIRTUALLY IMPOSSIBLE TO FIND LIKE THIS - SO DONT MISS OUT ON THIS AMAZING OPPORTUNITY!!!! This isthe Decca UK MONO Pressing and is in SUPERB condition!!!! The record is pressed on THICK quality vinyl. The Cat. No is LK 4605 on the ORIGINAL UNBOXED 'Grooved' Decca Label (see picture) and is a UK MONO Pressing!!!! The record labels are in AWESOME condition (see pictures) with NO wear, NO writing, and barely ANY spindle marks AT ALL!!!! IT IS VERY CLEAR THAT THIS RECORD HAS BARELY BEEN PLAYED AT ALL!!!! The vinyl is AWESOME condition!!!! Most of these 60s LPs had been to a lot of wild parties and are usually found totally worn out, and almost unplayable. This one is NOT and has NO scratches, NO hairlines, only 1 absolutely ULTRA light scuffline trace (only visible under the VERY brightest of lights! ), and only a VERY few of the lightest paper scuffsonly visible under light!!!! ITS AS SIMPLE AS THAT!!!! THE RECORD STILL RETAINS ITS ORIGINAL 'JUST PRESSED' LOOK AND LOOKS AMAZING!!!! It is also great to find that the record plays as STUNNINGLY as the visual!!!! It plays withNO pops, NO sticking, NO jumps, barely ANY crackle AT ALL, and only some EXTREMELY low level background sound on the run on grooves & gaps - NOT in the music AT ALL!!!! The sound quality is simply SUPERB with NO distortion and NO groovewear either!!!! The record must grade Excellent++++ if not MINT(Minus)!!!! AWESOME RECORD!!!! Believe me this record is NOT overgraded in ANY way!!!! I use STRICT RC grading standards - it is not in my interest not to!!!! Brillant!!!! The record also comes in its 'Handling/Playing' inner sleeve which is in SUPERB condition!!!! The ULTRA RARE 'MacNeill' Laminated MONO 'Trial' Cover (with different shade, thickness, colour & clarity!) is in absolutely BRILLIANT condition!!!! It has NO edge wear, NO spinal wear, only VERY slight corner wear (NOT through the colour! ), NO annotations, only a few VERY light creases (cover is VERY flat looking indeed! ), NO splits, only 2 or 3 absolutely TINY laminate lifts on the spinal edge, VERY shiny laminate, NO annotations, and NO writing!!!! The opening edge is beautifully straight with barely ANY feathering AT ALL!!!! Even the unlaminated back of the coveris in BRILLIANT conditionwith NO grubbyness, NO ringwear, SUPERB flipbacks, only the very VERY faintest touch of uneveness, NO rubbing, NO yellowing, and NO writing!!! !This cover must grade Very Good++++ if not better!!!! BRILLIANT COVER!!!! THIS LP IS SERIOUSLY RARE ANDVIRTUALLY IMPOSSIBLE TO FIND LIKE THIS - SO DONT MISS OUT ON THIS INCREDIBLE OPPORTUNITY!!!! HAVE A LOOK AT MY PICTURES - I DO MY BEST TO SHOW THE RECORD FROM ALL ANGLES AND MAKE THE PICTURES AS CLEAR AS POSSIBLE - THERE IS NOTHING TO HIDE!!!! It really is a GREAT looking LP and it is truly rare to find any copies of this MEGA RARE LP!!!! THIS WILL BE YOUR ONLY CHANCE TO BUY AN UK 1964 MONO 'TRIAL' PRESSING OF "THE ROLLING STONES" BY THE ROLLING STONES, IN SUPERB CONDITION!!!! Dontforgetto take a look at allmy other items including many other TOP LPs and contact me with any queries you may have. Postal discounts for multiple buys are always available - and I guarantee to ALWAYS undercharge on postage! Paypal, Bank Transfers, Cheques, International Money Orders, and Postal Orders accepted. Thanks for looking! Cheers!!!! !